First we need to create an .srt file. This is a special sort of subtitle format. Sounds complicated, but I’m going to guide you through how to create this file, only using the default applications on your Mac and PC. Now we need to construct what will be said in our Subtitles. There are three basic components that you need to add for each line of subtitling. When you want the subtitles to be displayed (start and end point). What you want the subtitles to display. Note: the colouring is for highlighting only and not a requirement when creating your Subtitles’. …I am saying this is the first in the sequence (sequences begin at 0), that my Subtitles will display from the first to the third second and I want to display the text ‘Hello’. In the above example it will say ‘Hello’, followed by ‘How are you?’ in the third second. Note: It is important to follow this formatting exactly, if you would like to see an example .srt file, click here. In the dropdown titled ‘Save as type’ select all files. Now type a name for your file, adding .srt to the end. Here’s a handy video if you are in doubt. Press ‘Format’ and press ‘Make Plain Text’. Add your title in the ‘Save as’ field. Now untick the ‘Hide extension’ tick box in the bottom left of the popup window. Delete the extension ‘.txt’ and replace it with ‘.srt’. Text edit will display a warning; press ‘Use .srt’. 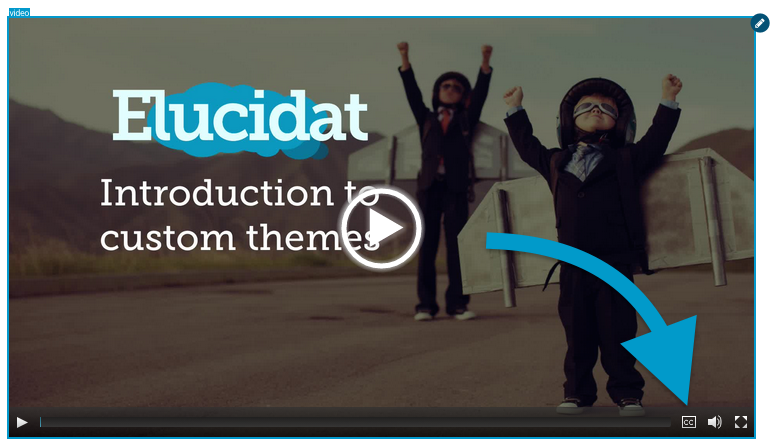 Elucidat will upload your file. Now when your Learner watches your video they can turn the Subtitling option on by pressing the ‘CC’ button in the bottom right of the video screen. You can add subtitles to your ‘In-page audio’ using the same method. Click the ‘In-page audio’ edit button. 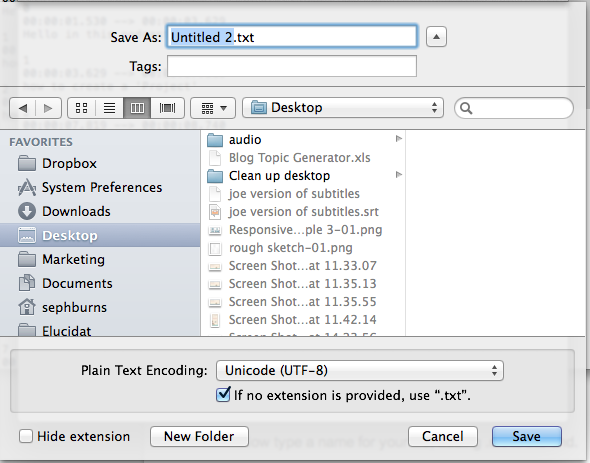 Press ‘Choose File’ in the ‘Upload captions/subtitles’ section and select your .srt file. Please note that in order to have captions display in iOS captions will need to be formatted slightly different. ...this means you can use the standard translation process to update subtitles for specific language versions.